I rode both the up and down and I prefer the up. I never got so much airtime and its just the fact waiting there for you take off up. The down one is really scary. Your 240 feet in the air waiting to fall isolated on your own when you finally get that stomach feeling once you fall unexpectably. Its a whole lot of fun. Great ride with an awesome view of the park!! Best S&S tower Ive been on. 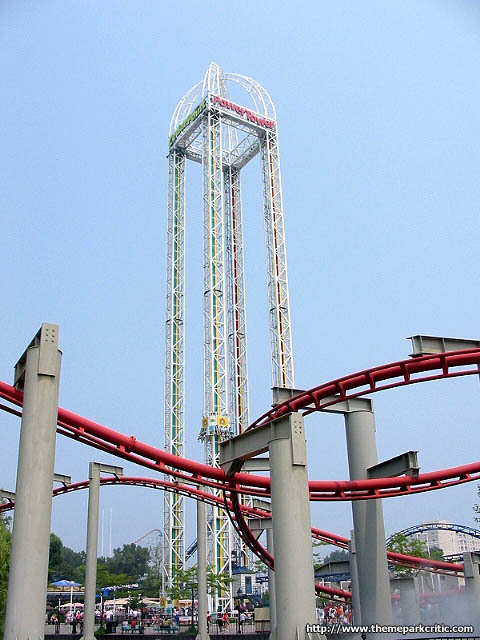 The space shot side really doesnt scare me but the turbo drop side scares the crap out of me every time. Being held 240 ft. in the air for 10 seconds with my legs dangling is still one of the most nerve racking experience of my life. Not to mention, the view from the top of the ride is arguably the best view in the entire park. Best tower out there. But....Ya gotta ride twice to experience it correctly--Once dropped down and once shot up. Its so frickin high and the view is outstanding! Man the first time I was on it I was just so scared. I had never done one of the rides that shoot you up so this was my first. Man what a ride to get started on. Great trip it just seems so fast. A must ride at CP. Amazing that this Cedar Fair version is so good and the one at Valleyfair is lame. However I am going to lower my score one point since the one at Adventureland is more enjoyable. I think the space shot side is better. Some good airtime at the top. 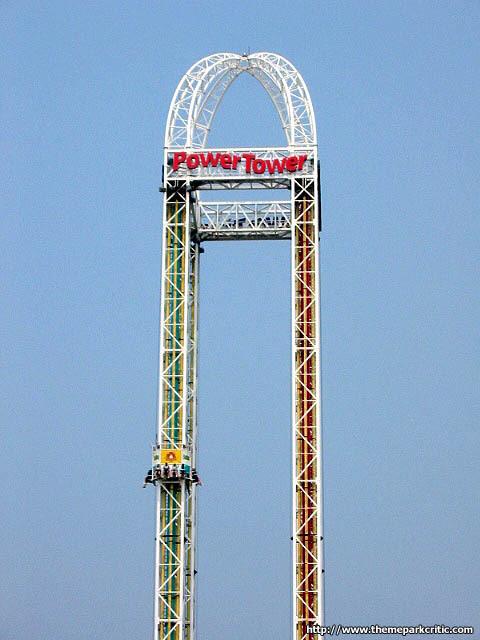 This ride is one of the scariest out there. Weather youre afraid of heights or not. The Turbo Drop (Down Side) is by far the better ride on this attraction. You wait in line and all you can do is look up at the immense structure in front of you. When you get on the ride and pull the harness over your shoulders, youre in for 2 minutes of pure drama. When you start to accend you just keep seeing the ground get further and further and further away. You are so high and you ask are we at the top yet? All you have to do is look up and you have an eternity to go till youre at the top. When you get there, and the air pressure peaks out, you feel like youre on top of the world...what a view! 10 seconds of sight seeing, then whoosh! down you go, but then before you know it... BOING! youre going up again, and thats when the fear stops and the fun starts. Its simply a joy going up and down until you come to the final rest and exit. This ride is simply a Thriller! A must ride if youre at the park. Gotta give it a 9 becuz of the view. How awesome!! The launch is cool and the ground just disappears in seconds!! 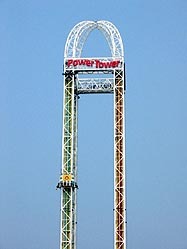 We rode this 7 times. No lines the whole time!! I was only on the red one, but man does that have some negative gs! The view you get on the top of the tower is awesome. Alot better than dominator. I knicked off a point because it was wayy too short.